Your septic tank is an important part of your plumbing system that can present problems if not properly maintained. In addition to comprehensive home inspections, I provide septic system treatment products to keep your system running trouble free and in good as new condition. Trust me, I’m a Chemist! I’m not only a Certified Home Inspector, I also hold a Bachelor of Science Degree in Chemistry, and you can believe me when I tell you this product really works! REX-BAC-T septic bio-packets are conveniently packaged bacterial digestant products, formulated to keep septic systems, cesspools and drain lines operating efficiently and effectively. Today’s anti-bacterial soaps, bleach, and drain cleaners, etc. 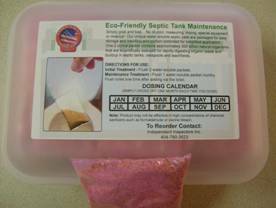 can kill the needed bacteria in your septic tank. The Biochemists at REX-BAC-T have developed the most cost-effective concentrated products available and a leading University’s Biochemistry department has independently tested it, proving the superior effectiveness of REX-BAC-T against many competitive products! In fact, one 2 oz. packet contains more microbes than 100’s of pounds of the national brand. This one really works! 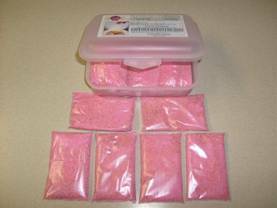 These pre-packaged and pre-measured water-soluble packets are conveniently packaged and easy to use and store. Simply grab and toss in the toilet... no dilution, measuring, mixing, special equipment or cleanup! This product is environmentally friendly! 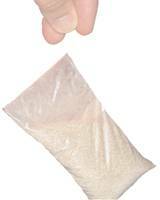 These rapidly dissolving packets with a unique micronutrient enriched formula, provide accelerated germination, growth, and superior enzyme production in the septic tank. The cost is less than $7.00 per month for each 2 oz. packet. That’s between $4.02 and $1.17 less per month than prices for competitive products at the big box stores or warehouse stores. We can save you up to $48.00 per year, THAT’S MORE THAN 6 MONTHS OF TREATMENT and remember that each 2 oz packet has 10’s of thousands of times more microbes than the national brands. Monthly treatment could potentially save you $100’s or even $1000’s of dollars in septic tank pump-out or drain field repair! ACT NOW! Order right now, here at my website. Simply go to the "Septic Products Payment" page to order with your credit card, or ask me to bring the product with me when you order your home inspection and save the shipping cost.